If you've got some small ants in your kitchen but you aren't really interested in spraying toxic chemicals around your food, there are natural ways to get rid of ants before the infestation gets out of control. You may want to look at natural options especially if you have pets or small children. 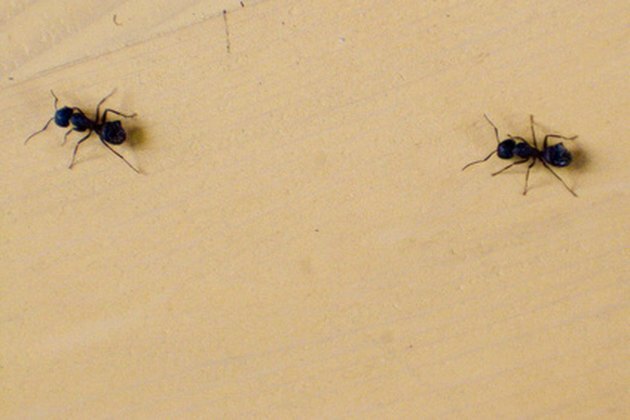 Get rid of kitchen ants safely and easily. Clean your kitchen thoroughly. Combine vinegar and water in a spray bottle and use the solution to clean sinks and countertops. Vinegar is an excellent cleanser as well as an ant repellent. Spray the ants and get rid of them. Remove any food items sitting on the counter top or anything open that could be tempting for the ants. Sweep and mop the floor as well. A clean kitchen is the first line of defense in getting rid of ants for good. Lay out homemade ant repellents. Use plastic margarine container lids or the tops of jars to make your repellents. Cornmeal is a great repellent because ants like to eat it, it swells inside of them and they explode. They also hate cinnamon, and sprinkling this around the perimeter of the kitchen as well as around doorways and windows will help keeps ants at bay. Cut up cucumbers and lay those around on plates. Ants don't like cucumbers, especially bitter ones. The combination of these natural remedies should repel your ants.